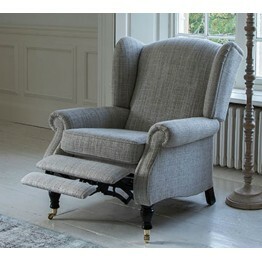 The Parker Knoll Chatsworth is a powered recliner chair with a traditional look owing to the winged back and also the classic style legs. There are different wood shades on the legs and also different caster colours for the front leg casters. 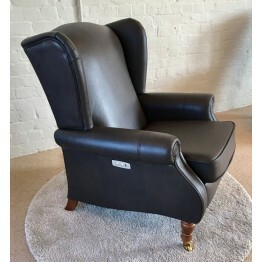 The recliner works very easily with the touch of a button as it is fully powered, and there is also a USB charging socket incorporated within the power switches. The inside back is shaped to promote a lumber region and also a natural neck support is created. There is a huge select of different fabrics available and also many leathers in a wide choice of shades too. This powered recliner has a very inviting look and sits well in the home whether it be a modern apartment or a country cottage. We offer free delivery across mainland England and Wales, and also year round keenest prices and delivery time from Parker Knoll is usually around 6 - 8 weeks.